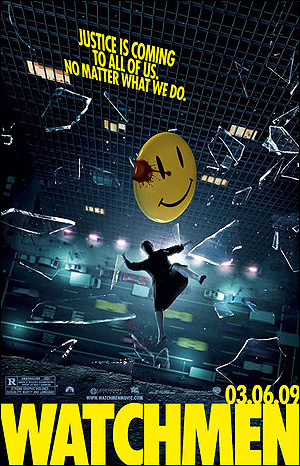 To many fanboys, the forthcoming screen adoptation of “Watchmen”, has internet message boards alight with “Please dont screew it up” and “It cant be done” talk. Even one of the original graphic novel (a really long comic to those of us unfamiliar with comicbooks) author’s, Alan Moore, has distanced himself from any adoptation of his novel, listed in the New York Times, Top 50 novels of the 20th Century. Zack Synder who brought us a previous comicbook adoptation with 300, has really immersed himself in the material. Video diaries from the set show us landscapes that look like they were directly lifted from the novel. Actors being interviewed speak of the enthuaism on set, their new found love for the source material. And all that good jazz. What is interesting for me, is that when I first watched the trailer many months ago, I hadn’t read the novel. The movie to me just looked like a bunch of Batman wannabes. It wasnt until a friend begged me to read the novel (and I make no apologies at this point for calling it a novel, although it might be just laziness on my part), that I picked it up. And I didn’t put it down until I read the last page. It was definitely like no other hero story I had read previously. So I myself join the fanboys in anticipation of the movie’s release. Recently another panic hit fanboy world. A secret press screening rumoured that the ending of the movie differs greatly from the novel’s ending. And while Kevin Smith on watching an early rough cut commented that the ending had changed slightly, this “new” rumoured ending was very different and for the most part non sensical. I will avoid entering into any commentary that would reveal either the novel or rumoured movie ending, a simple internet search will bring you that information. In my opinion, I believe Synder either filmed the alternate ending or has plants to throw off the fanboys rather than go for such a dramatic change to the story. After all all his interviews do allude to his desire to stay close to the original source material. When you consider some people’s arugement the novel’s ending was too far fetched, you only have to point at the Dr. Manhattan character, who is really the only “super” hero in the story. And he is blue and, er, floaty. Assuming the the 2 studios can reach a happy resolution in court next year to avoid delaying the movie release (Fox claims they had the rights to release this), next year we all will be watching the Watchmen, assuming of course its any good. ← What horror movie to watch this Hallowe’en?